“Here the state has it claws really dug in. It has its boot over us, but we dance. We do not ask the state for anything because we are a community with dignity.” The words cut through the stifling midday air and seem to slowly settle over us. “Self-governance is our dignity,” says Emerson, raising his voice so the circle of nearly fifty people can hear him . The “we” Emerson refers are members of?Casa de la Cultura (Cultural Center) in La Legua. 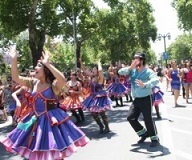 Located in the southern part of Santiago, Chile the neighborhood is renowned for putting up prolonged resistance, during the dictatorship and under democracy. The Casa is a large room, followed by a small kitchen, patio, bathroom and a bedroom. In the center of the room stands a large Mapuche flag that shelters the assembly. We were greeted with lunch: fried fish, salads, and fresh juices, but the?burgo?a–a traditional red wine and strawberry cocktail that quenches your thirst and cools you down–was the most delicious. Afterwards we gathered round, and Emerson, one of the youngest in the Casa, opened the?trawün, –“meeting” in Mapudungun–highlighting the autonomous nature of their work. Three workshops are held in the Casa and most of the people in the group participate: “Mapuche Weaving,” “Mapuche Being and Cosmovision,” and “Approaching Political Science”. They discuss how to organize and fight back, but without relapsing into academic modes. “It’s about unlearning the vanguards’ political culture that we learned in the organizations,” Cristian says. 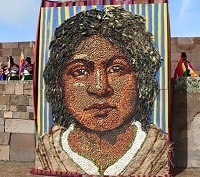 La Legua is actually three populations that together total more than 15,000 people. ?La Legua Vieja (The Old League) was populated by workers coming from the north, when the decline of the nitrate industry began in the early 19th century. They went to live “one league” from the center of the city, on land that in those years was all vacant lots. In 1947,?La Legua Nueva (The New League) was created. It was the first documented organized?toma (land takeover), according to historian Mario Garcés . While?callampas or “mushroom” settlements are formed by the individual aggregation of families that build precarious housing with waste materials on shores and rivers and mountainsides,?tomas are organized by hundreds of people coming together on a chosen piece of land, putting up housing quickly and marking sites for housing and public spaces–including a school, health clinic, and space for the community organization. Finally,?La Legua de Emergencia (The Emergency League) was formed in 1951 when the state allocated houses (for only six months) for people who came from the?callampas and downtown tenements, many on the banks of the Mapocho River. They were precarious and narrow (“Two little pieces of wood, kitchen and bathroom, no patio,” recalls a community member ) but many people remain there today. Garcés asserts that La Legua is “one of the most emblematic settlements of Santiago,” and stresses its organizational and political skills. “It had powerful neighborhood organizations in the 50s and 60s, and was the only urban settlement that fought against the military on September 11, 1973″ . Two strong currents merged in the establishment of La Legua, as in others on the industrial belt: the leftist parties–especially communists and socialists– and Catholic priests that harbored local organizations in the San Cayetano Parish, a hotbed of neighborhood activists who were sheltered from repression during the dictatorship. The first battle occurred in a factory next to the neighborhood, with dozens of members from various parties. Among them was Miguel Enríquez, leader of MIR who later was killed in an October 1974 clash. 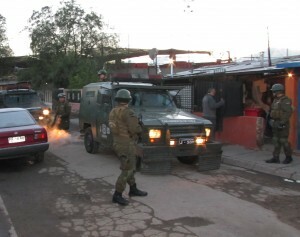 The armed militants were surrounded in the INDUMET factory. They shot their way out and took refuge in La Legua, where community members welcomed them . Shortly after, they machine-gunned a bus of Carabineros (riflemen) and forced them to surrender. In another factory in the neighborhood–SUMAR, where resisters had gathered–armed workers machine-gunned a military helicopter. It had to retreat with damage to the blades after being hit with 18 shots. The biggest clash took place in the afternoon, when they fired on a bus with 25 Carabineros and two officers. There were deaths on both sides.What happened on September 11, 1973 still resonates with the neighborhood. A detailed investigation by historians Garcés and Sebastián Leiva recounts the four clashes that occurred in the neighborhood that day, led by youths from communist and socialist parties and the Revolutionary Leftist Movement (Movimiento de Izquierda Revolucionaria, MIR). Founders (of La Lenga), unionists, and leftist militants converged in defense of the Salvador Allende government. Military incursions in the following days included war tanks and shots aimed at anyone who went out into the street. On Sunday, Sept. 16, they surrounded the neighborhood, aircraft passed low over the houses to intimidate them and all the homes were raided. They beat men and boys in the streets, destroyed their belongings, and took 200 prisoners. Some never reappeared, and several of those involved in the fighting on Spt. 11 were shot. It is estimated that post-coup repression caused 42 deaths in La Legua. Retaliation against a combative population. But by December, La Legua began to lose its fear. It joined the funeral for the Plan Leopardo victims–the assassination of five communist party members. “Later, the organizations slowly resurged, especially the San Cayetano Parish wing. There the Christians and non-Christians were regrouping to support each other to survive.”. Artes y Oficios is a narrow street flanked by low, poor (but not precarious) housing, between Avenue Las Industrias and Salvador Allende plaza, where there is a popular market. The Casa de la Cultura is at number 343. It’s about ten minutes from the National Stadium, where residents of La Legua and other industrial neighborhoods were transferred that September 11th. The atmosphere is austere, like the neighborhood. Some young people smoke in the door, women are cooking in the background, other racking chairs and tables. The meeting is part of “Latin America From Below,” a book and people’s organizations fair directed by the Quimantú editorial and followed by a dozen Chilean, Argentine and Uruguayan publishers . 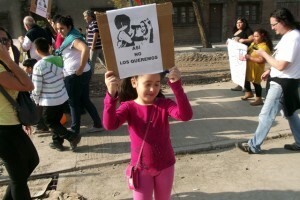 For just over a decade, La Legua–like La Victoria and other popular neighborhoods of Santiago–are “intervened in” by the state, meaning that the streets are constantly patrolled by police, with youth frequently accosted . Repression goes hand in hand with social policies that seek to convince the poor that their problem is small drug traffickers, not the political model established since the dictatorship in 1973. Karin and Cristian have a young daughter, but between them there are several more children. They tell the history of the Casa de la Cultura, born in 1985 when Chile was rocked by massive protests. “In the context of 1985, they decided to protest from and through culture,” Karin says. “Culture was the mantle that allowed them to meet; they worked on stories and poems with La Legua’s circle of poets,” Cristian interjects. The San Cayetano parrish, half a block from the Casa de la Cultura in the Salvador Allende plaza, gave refuge to those persecuted by the regime. “In the parish itself there are underground rooms,” Karin say with tone of mystery, as if they had been a refuge for militants. “La Semana Legüina was the group’s party at which the idea of recovering the history of the neighborhood was first proposed, but now it’s become our?carnaval,” she says. He says this as if he were sentencing them. The Casa de la Cultura also experienced difficulties, and had to find another location because the former was linked to a political party. And they began to work in a different way. For her, the meeting spaces, like the three workshops they established, are the most important. 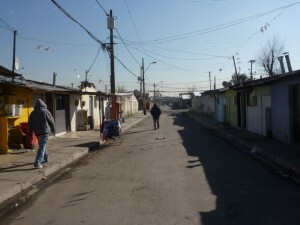 The presence of Mapuche indigenous people in a settlement where the majority is non-Mapuche is a cause for reflection. Karin’s last name is Cuminao. Although born in Santiago, she always knew her family came from the south. Cristian’s last name is Moreno, his skin is quite white. He was born and raised as a Chilean. Now they are a couple and both feel Mapuche. Although Karin’s parents didn’t speak Mapudungun out of fear, she was determined to learn it to recover their roots. It’s different for Cristian. He discovered the Mapuche world as part of political resistance, but today identifies with their worldview and culture. In La Legua there are many families of Mapuche origin, but they don’t identify as such. In the Casa the Mapuche worldview is expressed in the?trawün, or discussion held in a circle that can last for a long time, “as long as people might need–it’s a place for sharing what everyone carries, from food to words. There we are defining what to do and how to do it in order to be better,” says Karin. About identity, the conversation turns to women’s role. Several members of the circle said out loud that the Casa is sustained by women, as are many of the popular organizations. Tania, a strong young woman, offers infusions and mate, serving them, as one who offers hospitality, with simple dedication. Tania and Karin always cook, and don’t conceive of any other way of doing politics, to the point that they assert that food–and therefore the kitchen–is the center. “We do it with care and patience. We do a Mapuche ceremony before making the food, the food is very important, you can’t just throw it together, on the run, or eat without respect,” Karin continues. She gives an example. In the loom workshop there are 15 women who rotate cooking. There is no head cook; sometimes somebody coordinates but is not from a place of power. In contrast, the community carried out the first Bike Ride for Combative Memory of September 11 this year. In every place they stopped and talked with community members who resisted the coup that day, telling their stories. One way of rebuilding knowledge from below, through the collective memory. “In recent times our relationships have been more qualitative,” Cristian states. “Things aren’t done because recognition is expected, but because we want to make community, build ourselves.” He describes the case of several community members who left their wage jobs to do craftsmanship as a result of the “Approaching Political Science” workshops. It serves not only to change reality, but to transform themselves. “It’s hard to unlearn the political culture of the vanguards,” he declares. We end talking about carnaval. 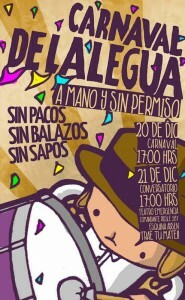 Before they called it?Semana Legüina, which harkens to the initiation of the settlement on Dec. 20. 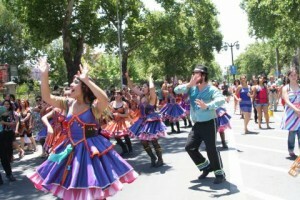 Now it’s a long parade of more than three hours, where 500 people pass through–dancers, musicians, and community members. And they cook for everyone. Emerson gets into the conversation, recalling the theme this year: “No cops, no gunshots, and no toads (informants)” . Something like that happens in La Legua, and in many similiar neighborhoods in Latin America. There are hundreds of small spaces like the?Casa de la Cultura, which over decades organizes dozens of small activities carried out mostly by youth and women. They are changing the world, long before gaining visibility in the main plaza. เล่นคาสิโนออนไลน์ให้ได้เงิน Todas las voces fueron recogidos en la Casa de la Legua, el 4 de diciembre, y en la feria América Latina Desde Abajo, el 5 de diciembre de 2014. เล่นคาสิโนออนไลน์ให้ได้เงิน Mario Garcés, “Las tomas en la formación de Santiago”, en AAVV?El mundo de las poblaciones, Santiago, LOM, 2004. “La emergencia de Legua Emergencia”, en revista?Perro Muerto, N° 4, julio de 2002. Mario Garcés,” Las tomas en la formación de Santiago”, p. 10. Todos los testimonios sobre esas jornada en Mario Garcés y Sebastián Leiva,?El Golpe en La Legua, Santiago, LOM, 2005. Sin policías, sin balazos y sin soplones. Gabriel Salazar, “La identidad de poblador es más importante que la de trabajador” en Archivo Chile, abril de 2005.